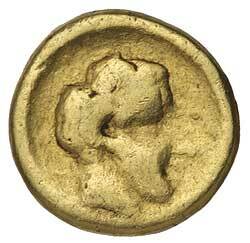 KYRENAICA, Kyrene, (c.435-331 B.C. 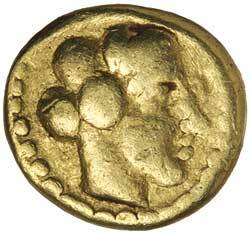 ), gold tenth stater, (0.87 g), obv. female head (Kyrene) to right, rev. head of Karneios to right, (Naville 9, SNG Cop. 1186, BMC 65, cf.CNG 78 [lot 1002 fine realised hammer $700US). Fine and rare. Ex Spink America, Auction Sale 9070, 1st December 1998 (lot 195).